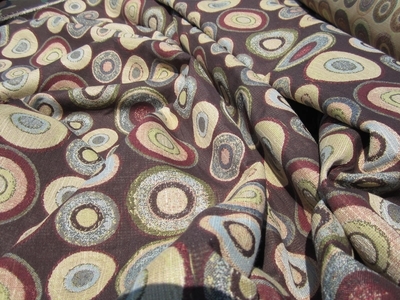 This fabric's name is "Karla" "Fun Circles Multi Tapestry" in the cocoa colorway. The background is soft brown and the circles are in shades of dark brown,maize, blue, cherry, ecru. Contents are 30% cotton, 55% polyester and 15% rayon.It's nonrailroaded (pattern goes up the roll) but can be used railroaded as well. Repeats are 14.25 across and 13.5 up. 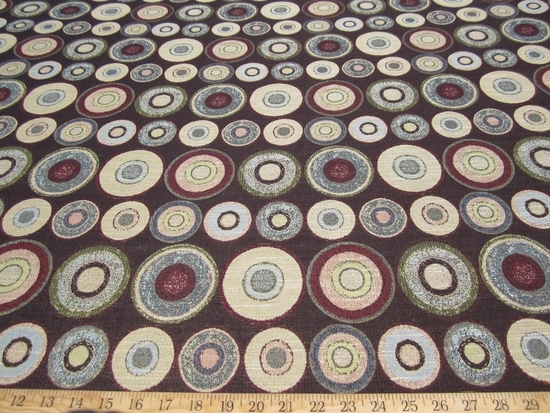 Width is 56" Your order will be in a continuous piece, the price is per yard.